Riba, J.; Romero, S.; Grasa, E.; Mena, E.; Carrio, I.; Barbanoj, M.
Ayahuasca is a South American psychoactive plant tea which contains the serotonergic psychedelic N,N-dimethyltryptamine (DMT) and monoamine- oxidase inhibitors that render DMT orally active. Previous investigations with ayahuasca have highlighted a psychotropic effect profile characterized by enhanced introspective attention, with individuals reporting altered somatic perceptions and intense emotional modifications, frequently accompanied by visual imagery. Despite recent advances in the study of ayahuasca pharmacology, the neural correlates of acute ayahuasca intoxication remain largely unknown. Riba, J. [et al.]. 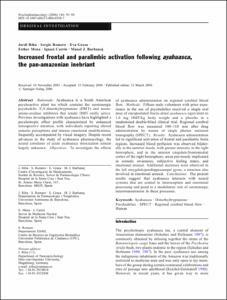 Increased frontal and paralimbic activation following ayahuasca, the pan-Amazonian inebriant. "Human psychopharmacology-Clinical and experimental", Març 2006, vol. 186, núm. 1, p. 93-98.